On June 15, 2005, Michael Allen Ficery, 51, an avid, experienced hiker and backpacker visited the north side of the Hetch Hetchy Reservoir in Yosemite National Park for a solo hike. 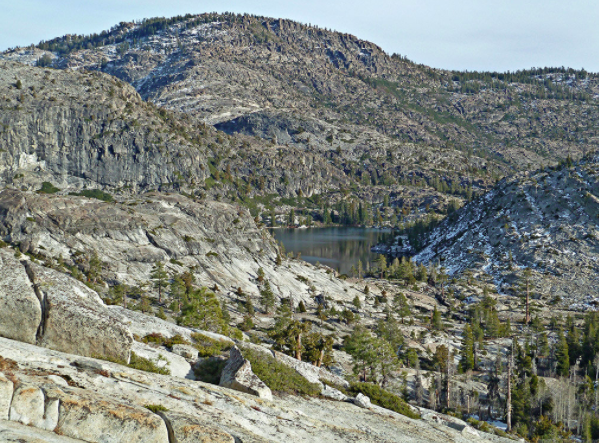 He had planned this hike to take him to Rancheria Falls, Tiltill Mountain, Lake Vernon and then through Beehive before returning back to the Hetch Hetchy Reservoir. At some point during the day, he decided to begin walking to the north up to the Pacific Crest Trail towards TilTill Mountain. This would be the last time anyone would see him. His family became concerned when he did not return by June 19th, four days after Mike went on his hike and when his wilderness permit expired. On June 21, they called the park service and an intensive search of the area around the reservoir and Pacific Crest Trail was launched. However, all that was found was a backpack near Tiltill Mountain just off the trail, containing a topographical map, a camera and a bottle of water (note some reports say that the pack was missing the map and the water but how would the rescuers know?). The search and rescue operation involved personnel from five counties with aircraft and tracker dogs. Apart from the pack, nothing else was found and to this day, 12 years on, Mike remains missing and on the NPS cold cases list. The NPS said that Yosemite accounted for one-quarter of all SAR dollars spent in 2005 - $1.2 million out of the $4.99 million. The park service spent $452,000 looking for Mike Ficery which shows how extensive the effort was. On April 5th, 2012, National Parks Traveler showed the following comment "Michael Ficery, the hiker mentioned above who disappeared in Yosemite in 2005, was my brother. While Michael was never reliant upon technology (he never owned a cell phone or computer), I firmly believe he was not adequately prepared for his hike in terms of the equipment he did carry. I'm sure he did not carry a simple signal mirror or whistle, for example. He also apparently deviated from his planned route, which made the search much more difficult. I strongly recommend to all hikers to consult any variety of "pack lists" found on the internet, focusing on the "ten essentials." And please make sure to leave a planned itinerary with at least one responsible adult (and stick to it). More excellent tips can be found on websites like REI, Scouts, Backpacker Magazine, and the "Science Drop" page of my own site at www.pack6.biz, among others. Please, if only for the sake of those who are waiting for you at home, do not attempt even a day hike without being adequately prepared. " It seems strange that Michael Ficery disappeared that day in June 2005 given he was an experienced back country hiker and had spent over 30 years hiking in wilderness areas. What caused him to leave his backpack behind that day and vanish? Despite the NPS spending close to $0.5 million on the search, Mike's body was never located and no evidence of bones, equipment or clothing.